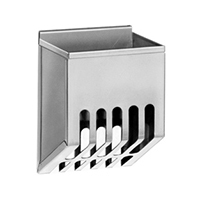 The Series 126-12 Mouse Feeder consists of an inside-application stainless steel feeder designed for use with Series 300 plastic small rodent cages. The wide back flange fits over the edge of most cage styles. They are easily removed for filling and cleaning. The feeder front and one side are constructed of #2 mesh for easy access to food. Series 16 feeder is an inside-application stainless steel feeder that is designed for use with Series 410 and 470 cages. The feeder mounts inside the cages at either the front or rear. For the Series 162 feeder, the cage rack shelf acts as a feeder lift.